London Days: Wishing you a slice of happy! As many of you know I love to play along with the challenges at Fusion but to be honest the latest one stumped me and I nearly gave up. I got caught up with the ties and red polka dot. I had been thinking about it for over a week. a Then yesterday I decided I would enlarge the photo and look closely at the patterns on the ties (not the red polka dot!). 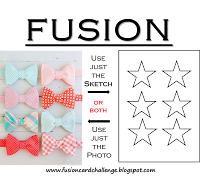 I finally had a ping moment and decided to make a card designed...now this is specific...on the right hand side of the plaid bow tie! 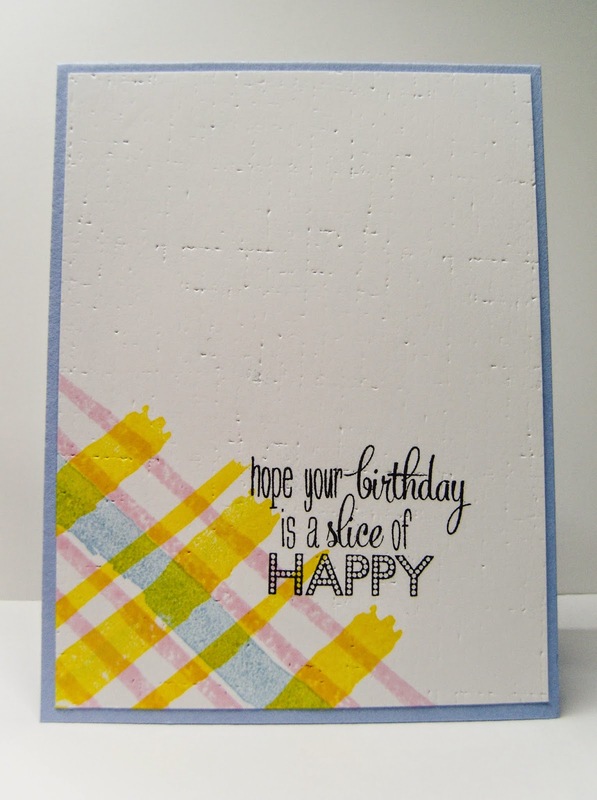 This card is going to a neighbour who celebrates his Birthday in a few weeks. Love that fun plaid just sneaking in on the edge Sandie! Gorgeous! So glad you stuck it out and played with us at Fusion! I think you turned up with a clever idea and nailed it!! Love that plaid you made..
Amazing how looking at something differently can suddenly give you an idea!! Love these colours and that linen effect reminds me of concrete everytime for some reason...its awesome! How clever to pick up on just the pattern! Looks wonderful!